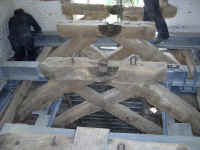 Work is nearing completion in Parham Church tower to restore our very ancient bells to full circle ringing. 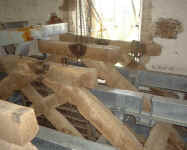 The three bells there were hung dead in the tower and are with bell hangers Hayward Mills in Nottingham for wheels and headstocks to be fitted. Hayward Mills have finished putting in the Silence Chamber below the bell chamber so that ringers will be able to hear the conductor's instructions when they ring the bells; and Hogg's, builders of Bury, have lime washed the walls and repaired the stairs up the tower and put in some electricity. Until recently you would go up some very worn stone steps to the Ringing Chamber, where the Ringers used to stand and will now stand again. Then up a long old ladder to the Bell Chamber, where the three bells were hung dead on a steel beam installed in the 1950's because the medieval frame couldn't stand the strain of swing chiming. At that time there was no money to do more, but in 2001 the Village held an open meeting and decided to raise money and restore them to full circle ringing and augment them from three to six. The cost of all this is £75,000 and we have just about raised that. 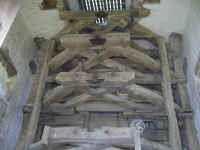 Our old bells comprise a 1623 bell cast by William and John Brend of Norwich and two very rare 13th Century bells, all in a 15th Century oak Frame. 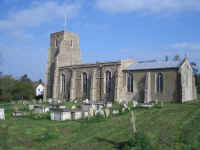 The two 13th Century bells were probably made for an earlier Church on the same site. We believe they were cast by John of Lynn in Kings Lynn between 1280 and 1320. (They are certainly both by the same founder and of similar date, since their shape and their lettering are identical. 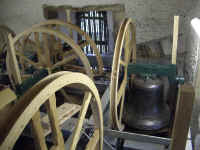 Our source for saying all this is Cautley's Bells of Suffolk, and Paul Cattermole who has visited us knows as much about East Anglian Bells and Bell Frames as anyone). Forty of us went to Loughborough from here on 9th March 2006 to see our new bells cast: in pretty well exactly the same way as they were cast in the 13th Century. One of the new bells is to be dedicated to the Americans who were in Parham during the Second World War and sustained some 670 killed in daylight bombing raids from Parham. 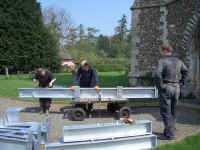 One or two of the Veterans may come for the dedication which will be at Evensong on 2nd July. The entire project will be completed and we will have the dedication service and a party to mark the day. The bells were dedicated on Sunday, 2nd July 2006. Details of tower & practice night.